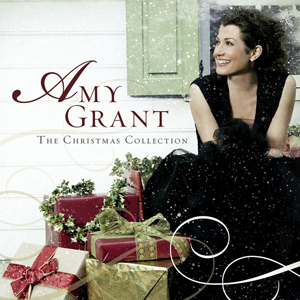 Amy Grant - "The Christmas Collection"
Amy Grant is one of the most successful Christian singers so it makes sense that she's also one of the most popular singers of Christmas songs. This album gathers the best of her previous holiday albums while mixing in 4 new songs. Over the years Amy Grant has recorded three timeless Christmas albums (in 1984, 1992 and 1999) so it makes a whole lot of sense to gather the best of each of those three albums along with four new tracks to create this album, “The Christmas Collection.” The album kicks off with the timeless “Jingle Bells,” one of those four new songs. Amy’s rendition is contemporary and fun and fast paced. The arrangement by Amy and co-producer Brown Bannister is simply inventive and breathes new life into the track. “It’s The Most Wonderful Time of the Year” was a huge hit for Christian music’s biggest star and has since become the most often played rendition of the song during the holiday season. Written with Chris Eaton, “I Need A Silent Night” is an interesting take on how the excessiveness of Christmas has made us long for silent evenings at home with our families while shopping for the latest and greatest gifts. Amy and Vince Gill’s daughter Corrina recited Luke’s account of the birth of Jesus at the end of the recording, thus forever freezing her seven-year-old voice in time. Amy and Vince co-wrote the jazzy “Baby, It’s Christmas” and you can hear Vince’s classic guitar playing backing her up as she singes the hopeful lyrics in a voice that somewhat recalls Karen Carpenter. “Hark! The Herald Angels Sing!” is another great track as is another track Amy co-wrote with Chris Eaton, “Breath of Heaven (Mary’s Song).” Fans of Vince Gill may recall that he recorded the same song for his “Breath of Heaven” Christmas album a few years back. With fifteen tracks, Amy Grant’s “A Christmas Collection” is the kind of holiday album you can put in the CD player and repeat. You can enjoy the timelessness of the collection while drinking hot coco or eggnog and enjoying Christmas with your family.